← Picture: Minnesota Twins Rookie Hazing Class Balloons! 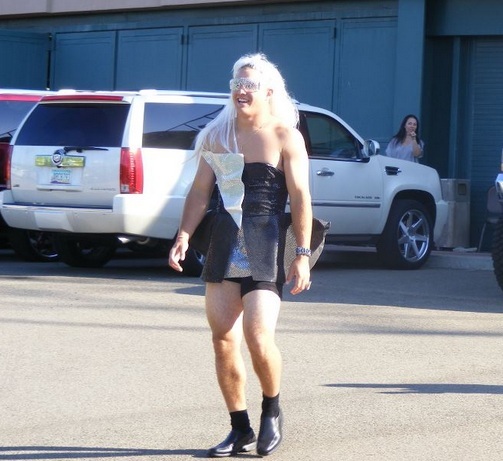 Pictures: LA Angels Rookie Hazing Day: Mike Trout Dressed as Lady GaGa and more! Mike Trout: NOT 'Born this Way"
The Los Angeles Angels of Anaheim joined the rookie hazing fun yesterday and hot prospect Mike Trout ended up with the best costume: Lady GaGa! After being named by Baseball America as the 2011 Minor League Player of the Year, the Halos has something special in store. More pictures from the Angels rookie dress up day can be found HERE. This entry was posted in Hazing, LOL, Los Angeles Angels and tagged Baseball, Hazing, Lady GaGa, LOL, Los Angeles Angels, Los Angeles Angels of Anaheim, Major League Baseball, Mike Trout, MLB, Rookie, Rookie Hazing. Bookmark the permalink. 2 Responses to Pictures: LA Angels Rookie Hazing Day: Mike Trout Dressed as Lady GaGa and more!